Using the power of a front end loader to dig a hole can save hours of time in manual labor. The front blade of the loader's bucket scrapes the earth as the loader drives forward, much like a potato peeler peels away a layer of potato. When the digging gets too hard the bucket is hydraulically turned upward to scoop up the scraped dirt. This process can be repeated over and over until the hole is as deep and as wide as desired. 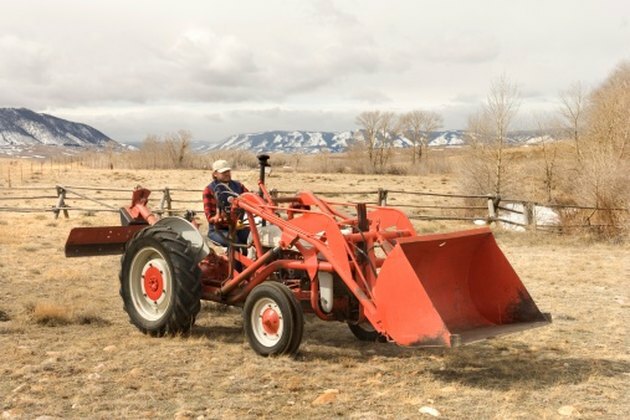 A front end loader is a multi-use piece of equipment. Set the bottom of the bucket on the ground using the hydraulic up and down lever. Tilt the bucket forward until the front blade is directed into the soil using the back and forth tilt lever. Put the loader in forward driver by pushing the forward and reverse lever forwards. Press on the gas petal with your foot to move forward. Drive forward until the loader begins to slow under the load of dirt it's pushing. Tilt the bucket backwards to scoop up the dirt using the back and forth tilt lever. Let off the gas. Lift the bucket up with the up and down lever until the bottom of the bucket is 12 to 24 inches above the ground. Put the loader in reverse by pulling the forward and reverse lever backwards. Back out of the hole with the scoop of dirt and drive to where you want to dump the dirt. Stop and then lift the bucket up until the bottom of the bucket is about 6 feet above the ground. Dump the dirt out of the bucket using the back and forth tilt lever. Push this lever forward toward the front of the loader to dump the bucket. After the bucket is empty tilt the bucket back up by pulling the tilt lever back toward the rear of the loader. Lower the bucket and then drive back to the hole. Line the bucket up with the sides of the previously dug hole and lower the bucket to the ground. Tilt the bucket forward until the front edge of the bucket is directed down into the dirt. Repeat the digging, scooping, lifting, emptying and re-digging process until the hole is the size you want it to be.